The key to freediving is having the best freediving fins you can get. Most people with any experience in this sport will tell you that being able to move effortlessly is one of the hardest aspects to master. 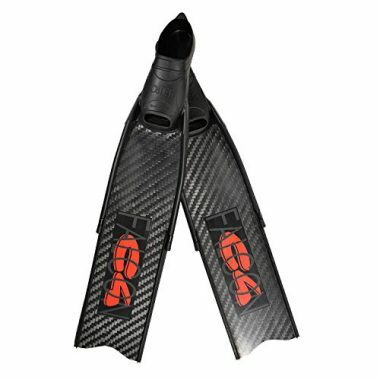 The specially designed fins help to propel you through the water without overexerting yourself. With that being said, finding the best freedive fins can be a difficult task. There are so many terms and materials that the average person may not understand. To make it easier we have created a list of the top freediving fins of 2018 so you don’t have to. MAKO Spearguns for spearfishing don’t just specialize in hunting gear – they also make excellent fins. Their Hunter line features fins that are made from a Polypropylene Composite material that has been created with thrust and stability in mind. After all, you need as much propulsion with as little effort as possible when free diving. These fins have a full sock style boot. MAKO has many years of experience in diving that they have applied to this part of the fin. They have made certain parts softer for comfort while others have been made stiff for maximum flex. This allows you to convert your leg movement into forward movement with ease. 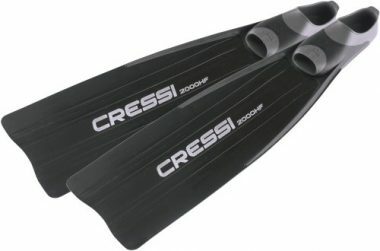 Cressi is one of the leading manufacturers when it comes to every type of diving. Their fins for freediving follow this trend of excellence. The GARA 3000 fins are a super long option that allows you to travel farther with less effort. The best part of these fins is that you can use them for freediving and scuba diving alike. They are designed to be powerful enough for freediving while still being short enough for scuba. The blades are made from a flexible material that allow even beginners to learn and grow their skills. Cressi has a patented 3 material molding process that makes the most comfortable boot. Unlike other fins, this set can be worn barefoot or even with a diving sock making these excellent for cold or warm water locations. You won’t have any discomfort when wearing these fins. Omer have one of the top rated freedive fins on their hands. These Stingray Fins are made using a low modular polypropylene material. This gives them a medium stiffness that is a great compromise from too soft or stiff. The first thing you notice is the ribs running the length of the blade. This system directs the water more efficiently and allows you to move faster. These feature a traditional full foot boot, which has been specially designed. Instead of a traditional 15 or 17 degree boot to blade angle Omer has made these 22 degrees. It has been found to give you the most thrust through your range of motion. When this is combined with a combination of Thermo-Rubber and two specially designed materials you get the perfect package. You won’t lose propulsion due to drag while getting the pop you need at the end of your stride. This material is also continued into the boot offering your feet maximum comfort. Freediving fins reviews agree that if you are serious about this sport these are the fins for you. They are made from a special blend of materials that is reserved for only the highest quality fins: 10% fiberglass and 90% brealis. These fins have been designed to grow with your experience level. MAKO Spearguns have developed a system that allows you to swap out your blades. Yes, you heard that right. With these fins you can upgrade and alternate through your fins depending on what you’re planning for the day. For example, if you are needing spearfishing fins one day and advanced freediving fins the next, simply swap your blades. The best part is this isn’t a long process. Simply undo a few screws and you’re ready to jump in the water. For this system to work they had to develop the most comfortable pair of boots possible. After all, if your feet aren’t comfortable you won’t want to use only this set. Not only have they made comfortable boots, but also made them compatible with angled blades. They have used the same boots that are found on their high quality carbon and fiberglass tips. 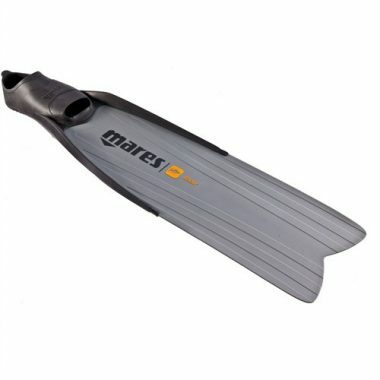 If you are the person who likes the lightest fins possible this Mares set is for you. The pair weigh just over 2 lbs. This is largely due to the high quality materials used in their construction. They have also been said to be on the stiff side of the chart, which is perfect if this is what you prefer. With that being said, you may like a softer option. That is no problem as these are another pair that have interchangeable blades. This means that the boot needs to be as comfortable as possible – something Mares has thought of. They have consulted a leading Italian foot clinic when they were designing the boot. This unique information has led them to increase the thickness of the instep which in turn leads to better comfort and more power. Mares has also tweaked the angle (22 degrees) and reinforcing of this fin. The core of the fin has added elasticity so the snap happens naturally on every kick. It also means that your foot remains in a natural relaxed position through the entire motion. The added ribbing also directs the water instead of it spilling over the edges. A v shape tip also helps your foot stay on the perfect track without wandering at the peak of your kick. 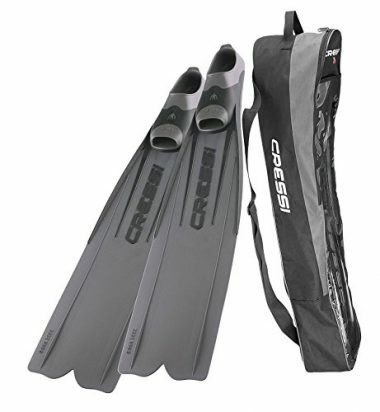 These are an excellent option for people just entering the sport of freediving. They feature an excellent build quality and comfort. The stiffness is ideal for people looking to hone their skills before stepping into a more stiff and difficult to control fin. 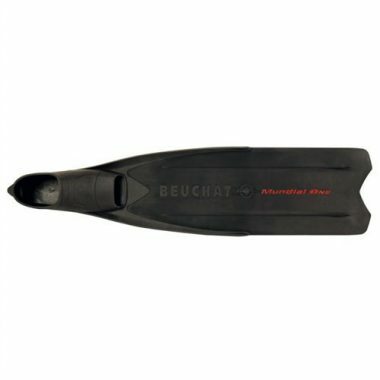 Beauchat isn’t the most well-known name in watersports but has created one of the leading fins for beginners. The foot pocket works with the fin to create the maximum pop even if your technique isn’t perfect. They do this by utilizing a two material system that includes Thermoplastic elastomer. The Mundial One Fins have a built in stabilizer system that restricts your foots movement and promotes the proper kicking motion. Most fins don’t incorporate a system like this but this company though it would benefit their customers. Leaderfins use a combination of high quality epoxy resin, carbon fiber and fiberglass to make one of the best freediving fins for spearfishing as well as spearfishing masks. They have coated the blades with a 1 millimeter neoprene and Teflon layer which allows them to glide easily through the water. You will find that it’s much easier to move with these fins. The foot pocket also uses a special blend of materials. It features a soft EPDM rubber that contours to your foot. When all of this is combined with rubber rails you get a freediving fin that is unmatched in performance and comfort. 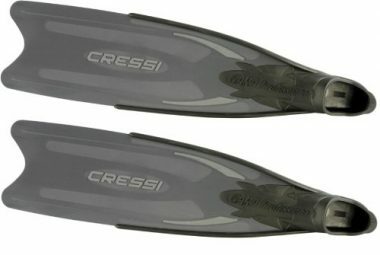 Much like their other option on our list, Cressi’s Gara 2000HF is a highly tuned piece of technology. It has a stiff plastic blade that gives you a great pop through your kick. You will find that these are also shorter than the 3000LD which makes them better for traveling. Their stiffness also makes up for this so you don’t lose any power. The smaller v notch at the tip also helps when it comes to maneuverability. The foot pocket is made of a soft material that does an excellent job at insulating your foot. This makes these fins great for cold water environments. The Stingray Fin from Omer is a carbon fiber option that comes in 3 stiffness ratings: 20 (soft), 25 (medium), and 30 (hard). The best part of this pair is that the blades are interchangeable. Because of this, you will find the boot to be exceptionally comfortable and flexible. The tips have a soft v shape which allows you to easily turn and adjust in the water. These fins are also one of the lightest on our list making them excellent for traveling. What is amazing is that Omer have developed these to not lose any pop or stiffness even with them being so lightweight. These are some of the highest tech blades you can get. The C4 Falcon Fins 25 are some of the best carbon fiber fins on the market. They feature a 100% carbon fiber Megaforce T700 blade. Much like other high quality fins, these use a more pronounced 22 degree angle boot. It will give your legs a break as it keeps them in an ergonomic stance even when resting. 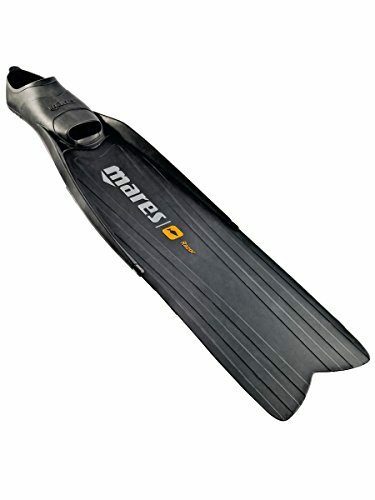 These fins have a soft rating which makes them ideal for beginners and divers on the lighter side (around 175 lbs.). They come in a variety of stiffness as well. This set of fins have also had extensive real world testing and have been found to be ideal at a 20 to 85 foot depth. If you are wanting to dive deeper it is recommended that you select the medium or hard option of these fins. They will give you more freedom when it comes to diving depths. Just keep in mind that the stiffer you go the harder it is to get the ideal pop. If you are just starting out in the sport we recommend the soft (25) fins. When looking for your next pair of freediving fins, there are 6 key factors you will want to take into account. 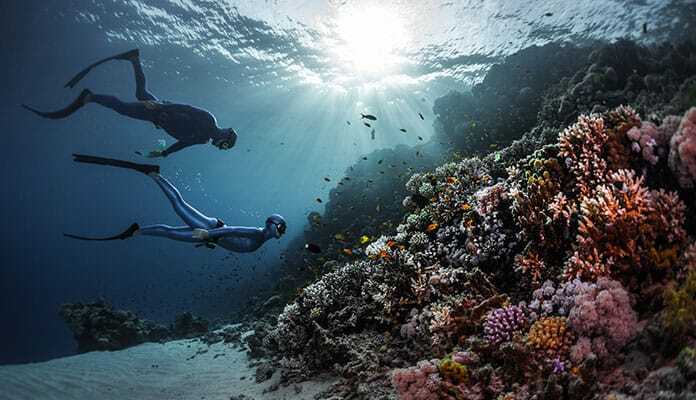 Understanding these aspects will help you make the most informed decision and help get you into the best pair of freedive fins. This should be the first question you ask yourself. Are you just learning the sport are you someone who has quite a bit more skill? Commonly people tend to overshoot their skill level which can make it so they don’t choose the best freediving fins. Remember that your skill level and ideal freedvie fin may not be the same as your dive buddies and that is ok.
You will want to consider how much you are going to be using your fins at this point as well. While you may be just starting out, if you plan to be practicing a lot and increasing your skill level then you may be better suited to get a fin that can move with your changing skill level. Beginners will be better suited opting for inexpensive polymer fins made of plastic. These will be more than suitable for the learning stages of diving. Alternatively, divers with more skill will be better suited with a higher quality fiberglass or carbon fiber fin. Freediving fins are not all created equally. There are three main types of materials that can be used. The type you get should be based on your experience level, amount of use and budget. You will be choosing between polymer plastic, fiberglass or carbon fiber materials. Polymer Plastic: This type of material is the most affordable option and is what most beginner divers opt for. They offer a good amount of flexibility and come at an excellent value. This is the most common fin type on the market due to their affordable price point and impressive durability. These are great freddiving fins to opt for when traveling as they can survive the bumps and scratches of travel. The affordable cost comes at a price as the efficiency of these freedive fins typically don’t last as long. This material has a memory technology that when used over time causes it to mold into a curved shape. While still usable, you will not receive the same efficiency with a curved blade as you would with a stronger straight blade. Fiberglass: This material is more expensive than the polymer plastic and does not offer as much flexibility. This is a great advantage as it allows them to maintain their shape even after extended use. This fin type is quite durable and can easily withstand some rough use underwater. 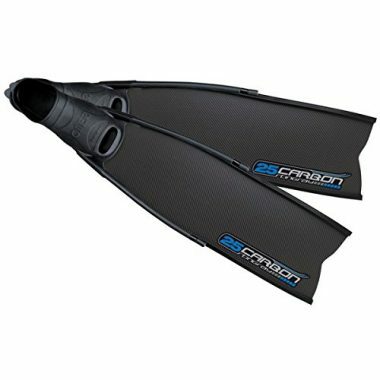 Carbon Fiber: This is the most expensive type of fin that is best suited for avid divers. This material provides the most high quality fin. Carbon blades are much more efficient than other material types. They feature the largest ratio between propulsion and energy making you get the most out of each kick. This fin type is incredibly lightweight making them popular amongst professional divers. Not without drawbacks, this fin type is quite fragile requiring added care. They are completely memory free which makes it so they will stay stiff and straight even after long term use. This makes them a far superior choice over cheaper polymer fins. It is important to consider your budget and come up with a number you are comfortable with before starting your search. 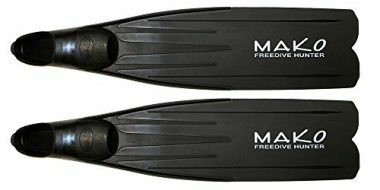 Freedive fins typically range in price quite drastically starting at around $80 for plastic fins. This price can jump to over $600 for the highest quality custom made carbon fin. The price ranges between plastic, fiberglass and carbon fins should be considered and go up respectively in that order. When considering your budget, remember that proper technique when diving will give you a far greater advantage than having a higher priced fin will. Always try your fins on before you buy them. If buying online, make sure you thoroughly understand the sizing charts. Keep in mind that most commonly manufacturers size their fins on the bigger size. This is because typically people wear socks with their fins. You will want to have a fin that fits snug around your foot. This will allow you to get the most efficiency out of your fin as a larger heel will effectively waste energy. If you plan to wear neoprene socks, check to see if the manufacturers have included this thought in their sizing chart. You will also want to look at the return policy of the fin to ensure that you can easily return it if the size isn’t quite right. While standard freediving fins come as a one piece set including both the foot pocket and blade, that isn’t your only option. 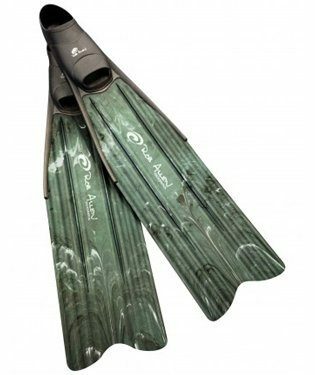 Some divers prefer to opt for fins that are detachable and therefore purchase the foot pocket and blade separately. This option is more expensive but does have many benefits that make it worth considering. You will be able to combine different brands and sizes making it ideal for getting the best fit possible. You also will receive benefits when it comes time to replace your blade and can do so without replacing your foot pocket. Freediving fins come in many different amounts of stiffness. The type that is best for you depends largely on your body shape. That is, your height and amount of muscles will affect your propulsion and therefore the type of fin that is best for you. Divers with short legs that do not have a ton of muscle will be better suited with a softer blade. Alternatively, fit divers with longer legs produce weaker propulsions making it better to opt for a fin with a longer blade. Generally speaking, opting for a blade in the medium to soft area will be the best bet for every diver. This will give you the bend you are looking for which will make your kicks stronger. Q: How Do I Use Freediving Fins? A: Freediving fins will fit on your feet much the same as snorkel and scuba fins will. Most will have a pocket for your feet slip in. This will make them sleek and reduce the drag through the water. There are many different techniques you can use when freediving. Some people like to kick their feet independent, like you would snorkeling or scuba diving. While others like to move their feet together in one smooth motion. No matter which way you kick your freedive fins your legs should be straight from your hip to your toes. Any bend in your leg will create unnecessary movement which will cost you unnecessary air – something you need dearly when freediving. Q: Why Are Freediving Fins So Long? A: These fins are so long because they need to propel you through the water. Essentially, the longer a fin is the more water it can move, which in turn pushes you through the water further. Smaller fins move less water and your movement takes longer and more effort. To generate the most efficiency these long fins require much less effort making it easier for you to dive below the water’s surface. Q: How Long Are Freediving Fins? A: Freediving fins vary in length depending on the type you decide to opt for. In general, you can expect these to be a great deal longer than other types of fins. You can expect the blade of your freedive fin to be around 22 – 27 inches. The length of your foot pocket size will vary on an individual basis making the length of your fin around 40 inches. Q: How Hard Is It To Use Freediving Fins? A: Freediving fins are designed specifically to be easy to use. They are made differently than snorkel fins so that they can deliver a maximum amount of efficiency. Their long blades allow for better propulsion through the water making it so that with every stroke you move further through the water. For those that have ever used fins, say with scuba diving, you will have a very easy time transitioning to a freedive fin. Finding the best freediving fins doesn’t have to be a stressful task. Knowing the advantages of each pair will help you determine which ones will be ideal for your use. If you are looking for an all around great pair we suggest looking at the modular fins. They will allow you to upgrade and customize your blades depending on your use. The most important part is having fun while diving! Do you use one of the freediving fins that made our list for your summertime adventures? Talk to us about how you like it in the comment section below.